This is really a catch-up post, since this is what I spent most of January and a little bit of early February sewing. 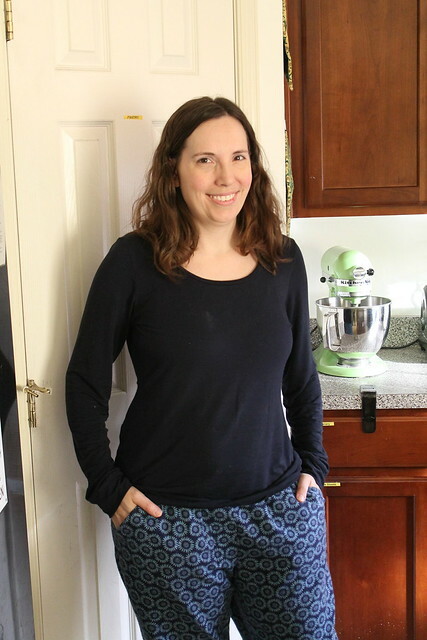 One of my #2018makenine goals was the Carolyn pajamas by Closet Case Patterns, because my sleepwear stash was in really rough shape! 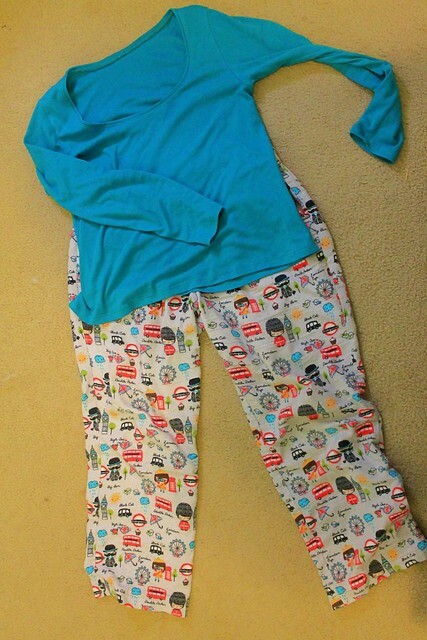 Especially my winter pajamas, since everything was either falling apart or horribly stretched or just too small now. 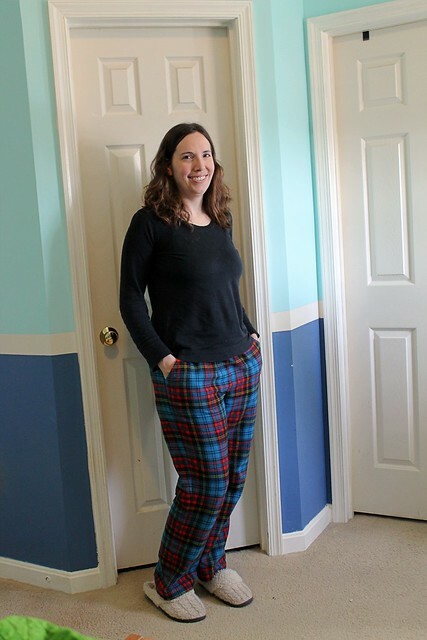 So I’ve replaced all but one set with some brand new pajama pants, plus some knit tops. 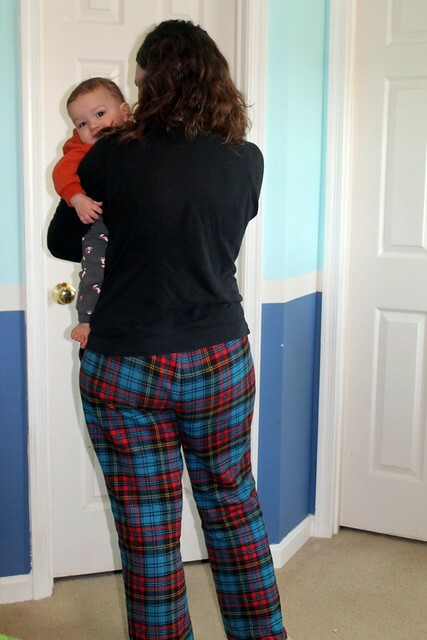 First up, the plaid pants. I actually bought this flannel to go with a Doctor Who-themed Christmas tee, not pictured here. The pants overall were pretty simple to make, especially since I just used black thread for all three pairs and knocked them out assembly-line style. The hardest part was probably just cutting this pair out, because of the plaid matching, but I think it went pretty well. The top that I’m wearing with this one is just a store-bought knit shirt that I used to wear at my garden center job, but never really pulled out for everyday wear. I don’t know why, it’s a perfectly serviceable black shirt, but it works well for free pajamas. Also, can I say how nice it is to have pajama pants with pockets? Let’s be honest, life with kids means that sometimes I don’t get my pjs off before mid-morning, so it’s nice to have somewhere convenient to keep my phone. 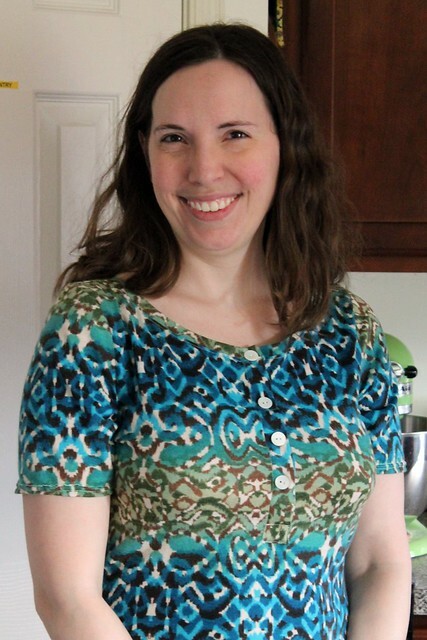 My second print is navy with some lighter blue sunflowers, and for the top, I went with the Sewaholic Renfrew. If it looks a little saggy in a few places, it’s because of the drape of the fabric. It’s one of those bamboo rayon blends that is probably all wrong for the structure of this top, but oh so comfortable to sleep in. Mostly, I wanted to do a wearable muslin so I could sort out my new sizing, after the complete disaster that was the basic black nursing tee that I made last summer. I’m happy to say that this worked out much better! I ended up going down another size, and grading in another size around the waist. So I’m feeling much more confident about my chances of success, next time I decide that I need a quick knit project and want to use one of the knits I’ve been hoarding for this pattern. Yay, I have one of my favorite TNTs back again! Since actually taking pictures of me wearing things is generally the thing that stands between me and more frequent blogging, I decided to let the floor model the last set. 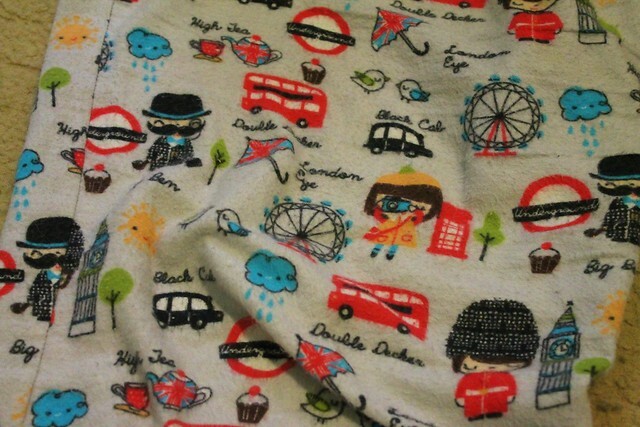 It’s this adorable cartoon London-themed print, and I paired it with a cotton-poly interlock that had been in my stash for ages. The top, of course, is the Plantain tee, since apparently that is what I make for something like every third project right now. This definitely won’t be the last time I use this pattern. Especially since my summer pj collection also needs an update, and I got Christmas fabric to make 2 more warmer weather sets! Including one with the actual shirt from this pattern. I’ve got two summer-specific projects that I’m in the very early stages of tackling first, but watch this space. Even though the theme of this year’s Day and Night Dress Challenge, hosted by the super-talented Elizabeth, was “Coffee and Cocktails”, I’m really Team Tea all the way. My gut reaction was that I haven’t been to anything resembling a cocktail party since the last wedding reception I went to– my life, friends, and family gatherings are quite casual. But since Elizabeth stated that anything that could work for a nice dinner counts, I figured I’d go for it. First up, my dress for meeting friends at a coffeeshop and drinking chai lattes, since that’s usually the best tea option. Or, more likely, going from chasing little boys around the house to my flute teaching. I’ve had this teal and olive knit print in my stash for about two years. 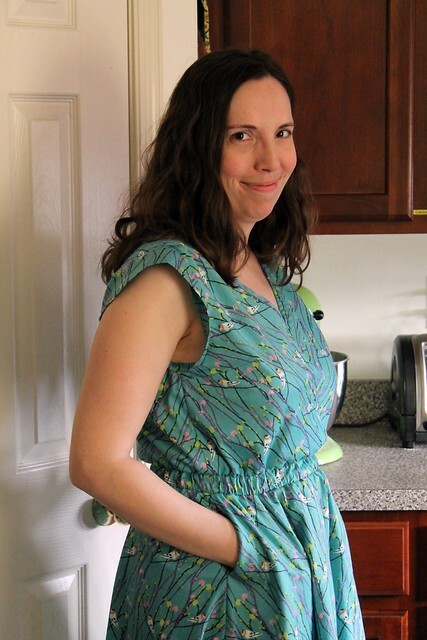 I’ve known for awhile that it wanted to be the Mesa dress from Seamwork/Colette, but pregnancy and lack of nursing access kept making me put it off. I knew I’d need an easy project to finish this challenge in time, so that bumped it up in the queue. My original thought was to try and add some kind of front panel for nursing. Then I realized that turning it into a Henley tee look would be much easier, and be more wearable whenever my nursing days are done for good. I followed a tutorial from Melly Sews, and did the closure with sewn in snaps and stashed buttons on top to hide the visible stitches. I really didn’t want to deal with buttonholes in a knit with a time crunch, and I didn’t have any set-in snaps that aren’t the leftover plastic ones from my diapers. I’m overall quite pleased with how well this worked, especially since I’ve already worn it for a full day and tested it for nursing. The only other change I made was to add 3″, because I’m getting up and down from the floor a lot and extra length is extra security. The construction of the main dress was simple, aside from some wresting with my coverstitch machine. Hopefully the hem will hold. I can see myself using this pattern again for sure. 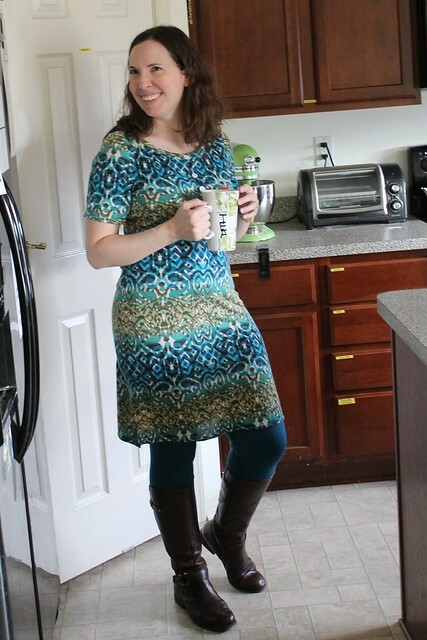 Without the added length, it’s pretty much perfect for a knit tunic! Side note: the teal Espresso leggings that I’m wearing with these are my first “refashion redemption project” of the year. I made them last January, but the lack of vertical stretch left them sitting way too low. So I finally got around to adding another wide waistband piece to the top so I can actually pull them up all the way. 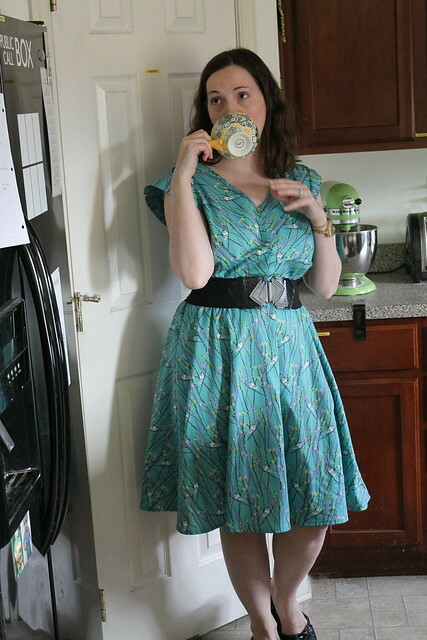 For my cocktail look, which is admittedly really more of an afternoon high tea dress, I decided to finally tackle the Deer and Doe Reglisse dress that I’d been hoarding for about 4 years. Since this is the first chance I’ve had in 3 years to actually dress for Easter, I wanted something that screamed spring without being too pastel. So this Art Gallery voile that I got this past Christmas was perfect! Finally, I added 3/4″ to the bodice to lower the waistline, and shortened the dart a little. I should have lowered them, since even though I did some basic tissue fitting to check, I completely failed at that and they sit too high. But the bodice is loose enough that it’s not a big deal. Honestly, in this picture, I can’t even see the darts. So I really doubt anyone will notice except for me. Part of me does wish I’d had the time to make a muslin of this, because aside from the dart issue, the armholes are a little too low. Hopefully it won’t be too noticeable, since it’s not like I walk around with my arms raised over my head, and the angle I have to hold them at for flute playing is probably okay to hide any visual bra. 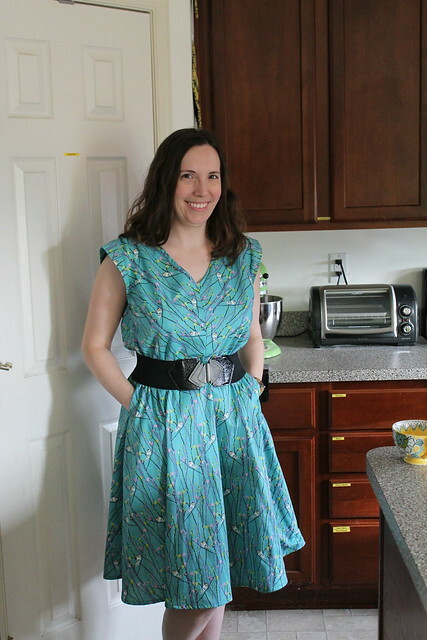 I’m also not sure how I feel about the look of the elastic, waist, but I do have a belt that works with it. One last outtake, in which I display what happens when I try to look sophisticated. I’m undecided about using this pattern again, since I only need so many dresses. But I might be able to hack it up some, like use it to make a fuller elastic waist skirt than my Rae skirt. And I did see a tutorial for using it to make a blouse. So maybe? Thanks for hosting this challenge, Elizabeth! It definitely gave me a morale boost to know that I can still manage to participate in some community challenges, even though I don’t usually finish things quickly. And knowing that my Easter dress is already finished definitely takes some pressure off!